Convention Centers demand a type of high-traffic carpet construction to withstand the heavy foot traffic it will certainly receive. Convention Centers often receive the very highest amount of foot traffic of any type of public space, so it's important to understand the specifications and construction methods to enhance the carpet. Interior design firms and end-users can often be confused as to which materials, machineries, and densities will provide the most durable product on the floor. So let's try and go over what truly increases durability, cleanability, yet still combines the beauty and vibrance of the colors and patterns. When specifying custom designs, there are three main carpet construction method to even consider. Printed Carpet, CYP Carpet, and Axminster Carpet. If a Convention Center is even considering Printed Carpet, it's most likely for budget reasons. Printed Carpet is inferior to both CYP and Axminster when it comes to strength and durability, but provides a more affordable product. Design capability is basically unlimited, so it's tempting, however, the investment is not worth it. The longevity of printed carpet is estimated around 5 years, and you only save around $5.00-$8.00 per square yard. It's more like a quick fix. Widths of usually 12' and 13'2"
When specifying CYP Carpet, it's usually produced with Solution Dyed Nylon. The advantages of SDN are excellent, but you are limited to an amount of colors to select from. Also, CYP can only produce carpet patterns using a total of 6 colors. This is typically enough for hotel and condo public space, but for convention centers, the patterns and repeats are large. Therefore, 8-12 colors is often desired. With CYP carpet though, you get the option to texturize the carpet. CYP produces either cut pile or loop pile, and can add a different shade of a color. The affect can mimic a different color, potentially making it look like more than 6 colors. CYP machinery is also unlimited in design capabilities, making it a very useful product for Convention Centers. Axminster Carpet is the cream of the crop for Convention Centers. With its woven construction, the backing and the yarns are basically one component, stabilizing the carpet forever, and providing the most durable construction on the market. Design capabilities are unlimited, and you can normally select designs of up to 12 total colors, and sometimes even 16. Most Axminster Carpet nowadays is produced with a blend of 80% wool and 20% nylon. Depending on facility though, some may consider producing the Axminster Carpet with Solution Dyed Nylon. SDN is useful if the carpet is exposed to heavy sunlight. Many interior design companies love the 80/20 blend because it provides the most extensive color range. Also, the colors are extremely vibrant, and create beautiful designs. Widths of 12' and 13'2"
Each carpet machine is capable of producing the finished product in various densities. Royal American Carpets highly recommends a minimum of 42oz. density for all areas of heavy foot-traffic. Usually start with a 44oz. density for maximum durability, but sometimes the budget requires a reduction. Some manufacturers may offer a 36oz. density, but this will hold up for a much shorter period of time. Perhaps 3-5 years, rather than 7-10 years, depending on the care. For more information about Royal American Carpets and our products, please feel free to contact us anytime with any questions or concerns. 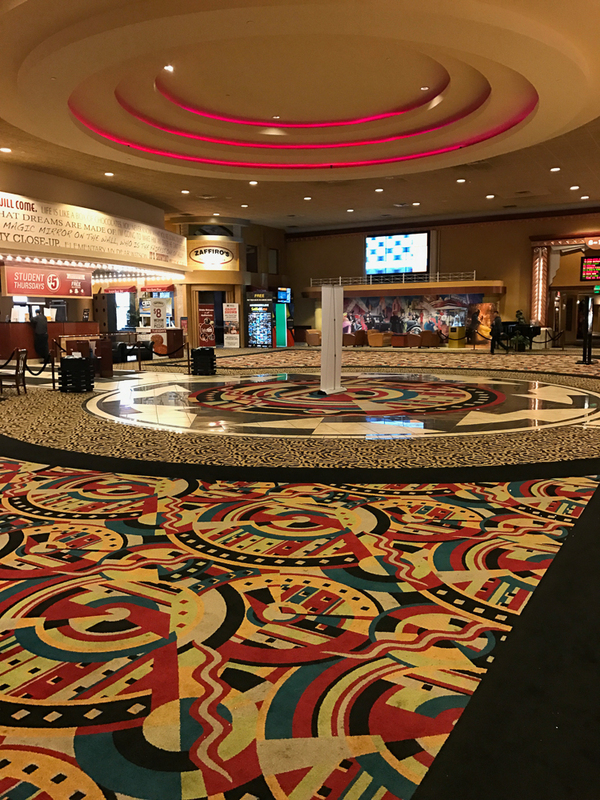 Our design staff looks forward to the challenge of creating a unique carpet design that will make visitors forever remember your Convention Center space.